In Part 1 of this series, we took a look at tools that manage multiple social media accounts. Part 2 was about analytics that dive deep into the social streams and emerge with data that helps you understand what’s happening. These were top-level tools; this post is going to get a lot more granular, taking a look at all the tools that have sprung up to help individuals and businesses manage the relentless flow of information on Twitter, as well as make sense of what’s going on with the quirky new darlings of social media, Instagram and Pinterest. Again, by no means is this an all-inclusive list. Obviously, new tools spring up every week. We’ve come a long, long way from the early days of Twitter where skeptics scoffed “Why should I care about what sammich some loser had for lunch?” These days, Twitter is an essential tool for breaking news and measuring what people are saying in real time. Many of the reputation analysis tools look at the sheer number of Twitter followers as an indication of how influential you are. Heavily weighted towards athletes, celebrities and digital pundits, Twitter is an essential part of any social media mix, if for no other reason than to monitor to figure out what your audience is talking about amongst themselves. These tools will help you take Twitter from being a haphazard place where you sporadically shout about yourself, to a more planned, strategic environment, where you interact with people in ways that lead to specific, positive business outcomes. NOTE: In the past year or so, many Twitter tools have added Instagram functionalities. This makes sense, because Instagram is such a mobile-oriented social platform, as is Twitter. There are, however, also some Instagram-specific tools that have been rolled out in the past year, in response to the meteoric growth in usage of Instagram. It is almost hypnotic, watching what the world is talking about. 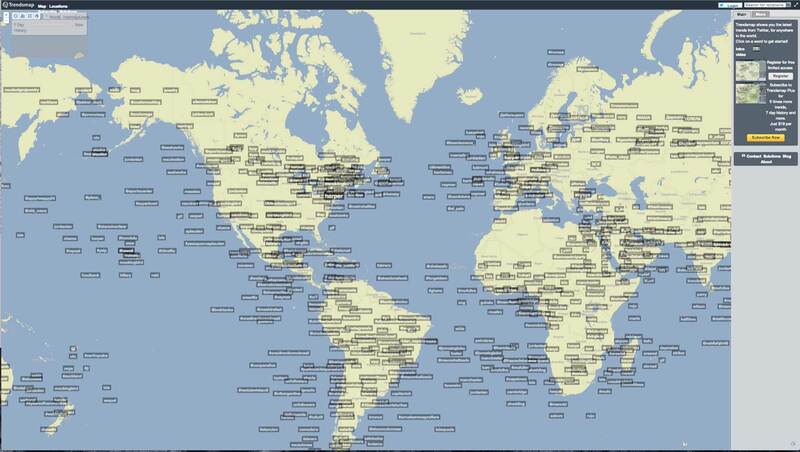 You are literally listening in on the global conversation, like a sneaky person at a coffee shop. Well, if you can read basically every other language on the planet, that is. Google Translate to the rescue! Shows the most popular tweets on Twitter overlaid on a map of the world. This tool used to be free, but now they want as much as $20 a month, if you want to be able to drill down to see what people around the world are talking about. Still, this can be a hypnotic, funny, terrifying view into the differences and similarities of the global internet community. “Shortcuts lead to long delays.” By which we mean, yeah, you can buy followers … but if you’re doing it to impress people who actually know what they’re doing on the social web, you’re not going to get the results you’re hoping for. Nobody likes a con man. Identifies anyone who has followed you and then “unfollowed” you after you follow them back (one of the key indicators of a spammer, troll, or just a sleazy user trying to build an audience without actually sharing anything of value). 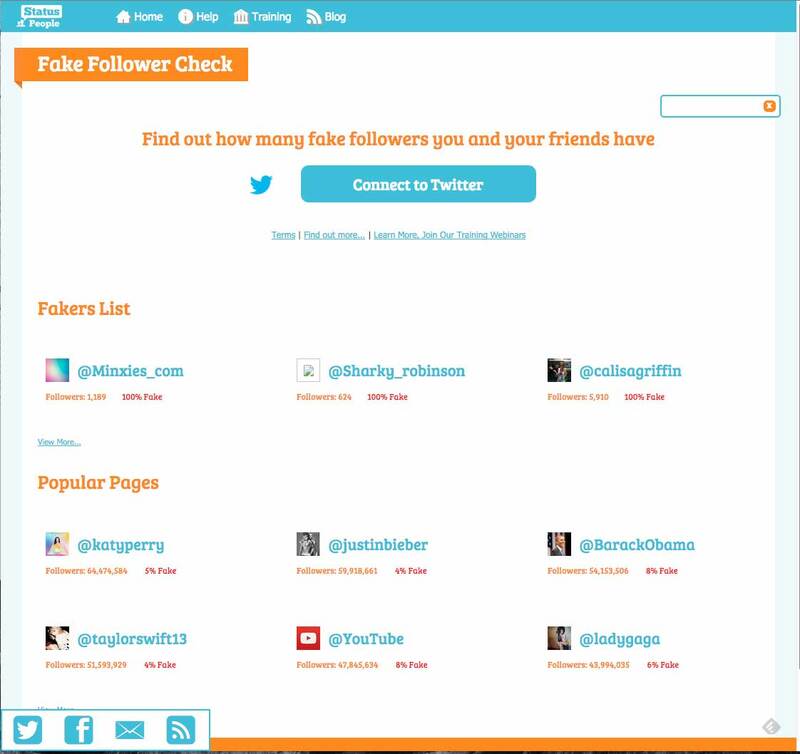 Also provides lists of people you follow who are not active on Twitter, as well as people you have followed who have never followed you back. 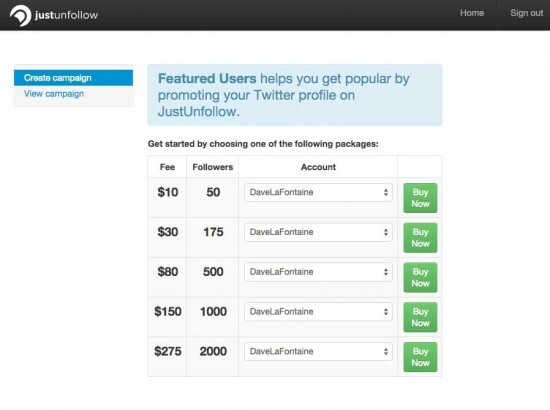 UPDATE: In the last few years, JustUnfollow has rolled out a professional-level suite of services, aimed at empowering people who have very large (as in, 10,000 or more) followers to manage their Twitter and now Instagram presences. They’ve also added a “Featured users” list (see screen capture above) so that you can pay to get more followers. Unfortunately, lots of companies (and not a few politicians) have found it expedient to “seed” their Twitter accounts with legions of fake followers. Fake Followers helps you point out that these virtual emperors are strutting around buck-naked. You might also want to run a check on your own account, to make sure that you’re not getting punked. 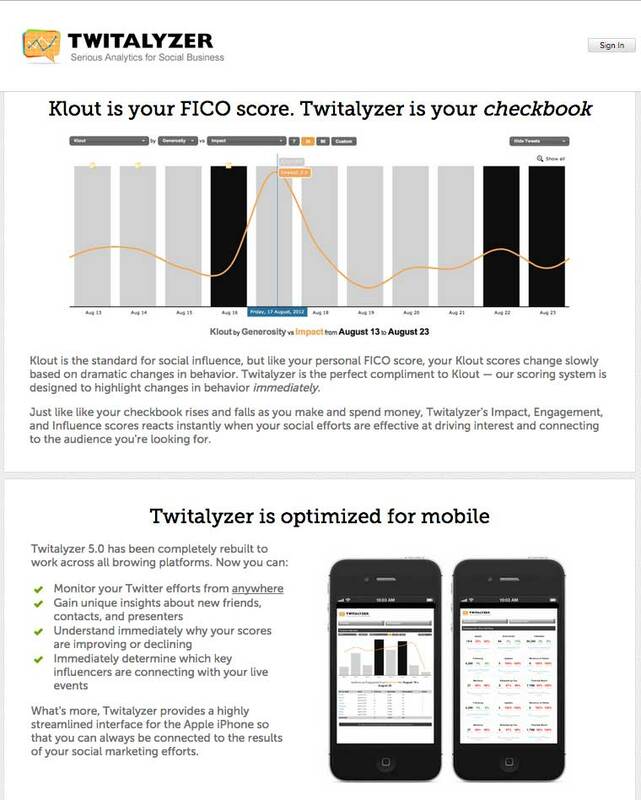 Now a paid-only service aimed at CMOs who want to figure out if the time/money they spend on Twitter has any ROI. 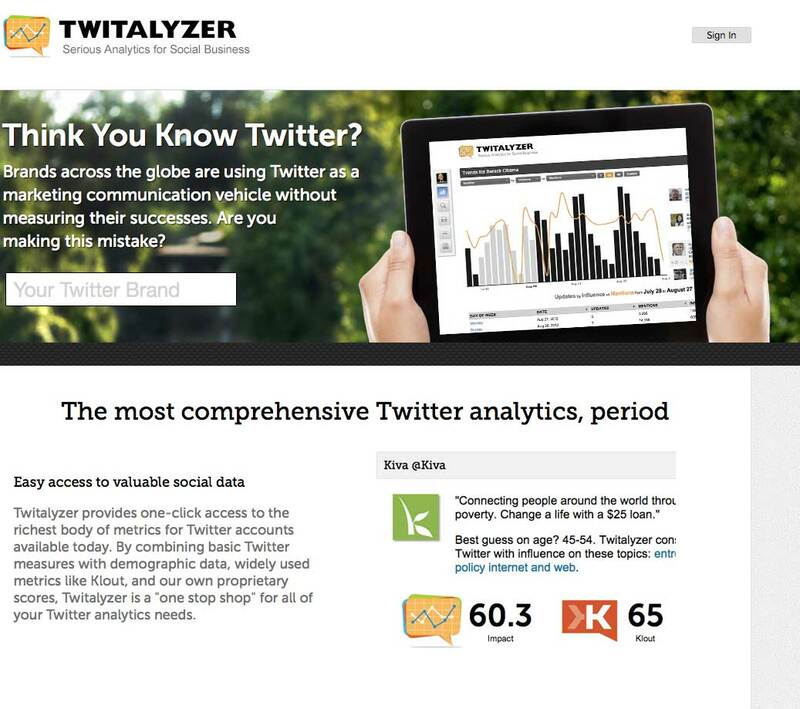 Like many tools on this list that have been around for more than a year, Twitalyzer has “pivoted” in search of a more popular (READ: profitable) niche in the market. They used to just scrape and analyze Twitter data, but now by combining demographic data, Klout and their own analysis engine, they’re not just about identifying influencers, but about measuring the success of your social marketing campaigns in realtime, and then delivering those results to your mobile phone. Which makes sense if you’re a Chief Social Marketing Officer for a high-level agency. Less so, if you’re not. They’ve also eliminated any free or trial version of their services. Just because it’s the internal tool of Twitter, doesn’t mean that it’s just some vanilla offering. Without getting into a whole huge discussion about server loads, searches triggering SQL requests and whatnot, just know that Twitter walls off access to its database of Tweets after a certain time period (it used to be 7 days, then was extended to two weeks) for third-party searches. Basically, so you can’t just build something that hits their API and produces massive load on their servers, just so you can make money. No, they want to keep that money in-house. So the advanced search function appears to be unlimited – as long as you do it through Twitter. You do have to put up with the fitful refreshing of an “infinite scroll” web page when you are trying to browse through a search that returns a large number of responses. Meshfire says that have a working AI for social. Kind of like a Terminator-Skynet for your Twitter feed. 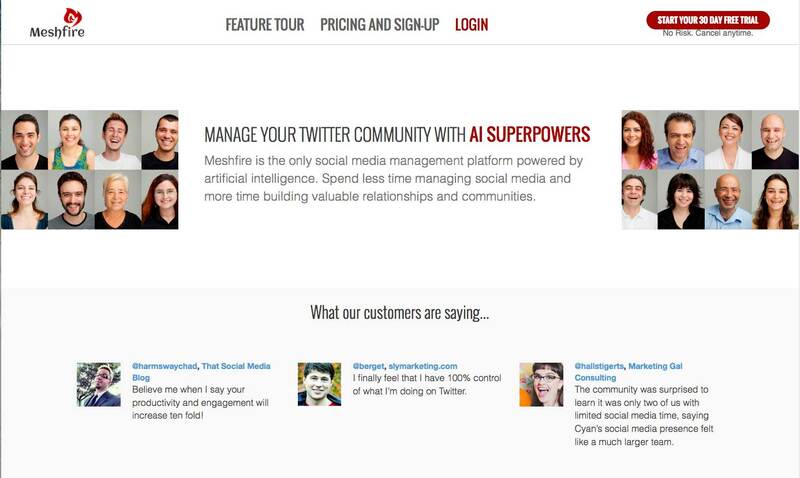 This social media dashboard claims to have an AI (Artificial Intelligence) that is capable of “constantly monitoring your Twitter traffic, and picking out all the important tweets and adding them to your task board.” Basically, Meshfire is supposed to replace the intern that you put in charge of watching Twitter. They also offer analytics and collaboration tools for about $8/month.